Former Florida Gov. 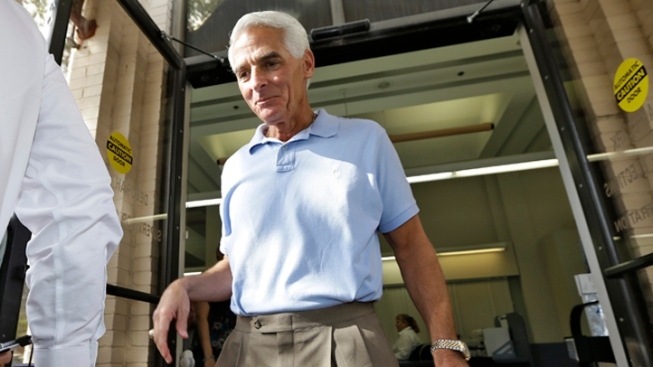 Charlie Crist holds a big edge over Republican Gov. Rick Scott among registered Florida voters in a hypothetical gubernatorial matchup in 2014, a new poll shows. Crist was favored by 50 percent while Scott was preferred by 34 percent in a survey of 1,000 registered voters conducted March 13-18 by the Quinnipiac (Conn.) University Polling Institute. It also showed that Democrat Alex Sink, who lost to Scott in 2010, would defeat the governor by a margin of 45 percent to 34 percent if the election were now. The poll's margin of error is plus or minus 3.1 percentage points. Half of those surveyed said they view Crist's switch from the GOP to the Democratic Party as a sign that he is a pragmatist, compared to 40 percent who saw it as a negative and an indication that Crist lacks core beliefs. "The fact that voters think it's an asset that former Gov. Charlie Crist moved from conservative Republican to a Democrat with very different political views will be a key metric to watch between now and the 2014 voting," said Peter Brown, assistant director of the institute. "Those numbers indicate Republicans will have a tough job turning around Crist's lead over Scott by reminding voters of Crist's evolution." Crist, who was governor from 2007 to 2011 but lost an independent campaign for the U.S. Senate in 2010 to Republican Marco Rubio, has not yet announced his political plans, though he has been actively speaking to Democratic groups across the state. Crist also fared well on the popular appeal question with voters. While 49 percent viewed him "favorable overall," 30 percent had an unfavorable view of him. Just a third of those polled see Scott favorably compared to 46 percent who have an unfavorable view. Both would fare well among voters in their own party, but Crist is preferred by 49 percent of independents compared to 29 percent who would vote for Scott if the election were now. There was, however, a thread of good news for the embattled governor, whose job approval rating remains upside down with 49 percent who disapprove of his performance in office compared to 36 percent who approve of how he's handling the state's business. Despite Florida's improving economy, only 32 percent said they believe Scott deserves a second term. Scott has made creating jobs his top priority and the state's unemployment rate has dropped to a five-year low since he took office in January 2011. Scott, however, would handily defeat Agriculture Commissioner Adam Putnam in a GOP primary, a smaller survey of registered Republican voters showed. That sampling of 353 GOP voters had a margin of error of plus or minus 5.21 percentage points. The survey also showed that Crist and Sink would both defeat Putnam. Crist was favored 49 percent to 30 percent in a matchup against Putnam while Sink prevailed in a similar matchup, 37 percent to 29 percent. 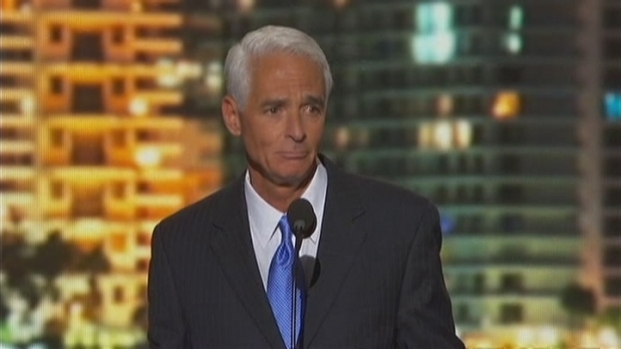 Charlie Crist Speaks at the Democratic National Convention on Thursday.